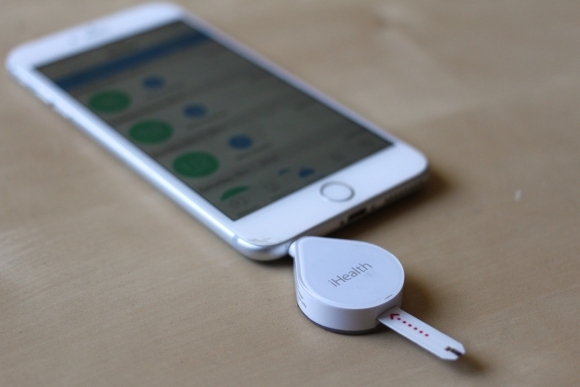 The iHealth Align glucose meter’s appeal is undeniable: a tiny, accurate, low-cost ($16.95), iPhone-compatible glucometer with affordable test strips ($0.25/strip)? Sign me up! Unlike it’s bigger brother, the creatively titled “Wireless Smart Gluck-Monitoring System,” the iHealth Align foregoes wireless connectivity in exchange for plugging into the iPhone’s headphone jack. The Align also achieves it’s sleek form factor (and price tag) by eliminating the display, having users rely on the iPhone screen. Unfortunately — in the process of the review, there were issues. Let’s start with a quick history lesson. 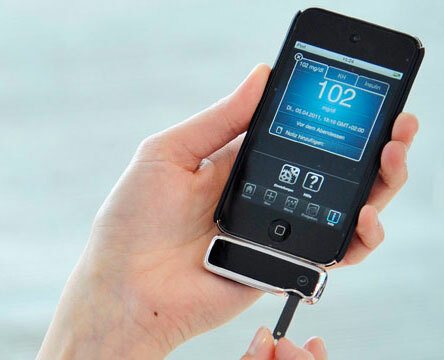 In 2011, the iBG Star was the first FDA-approved glucose meter that was compatible with the iPhone. I absolutely loved it, and it was truly ahead of its time: beautiful design, operated in conjunction with the iPhone or as a standalone glucose meter, and the app was excellent. As the first of its kind, the iBG Star was unfortunately quite pricey ($75, 50 test strips cost $65), but more than that, it was rendered obsolete a few months after launch when Apple introduced the iPhone 5 and abandoned the 30-pin connector that the iBG Star requires. The iBG Star was never updated with a Lightning connector. 3 years later, In many ways, the iHealth Align is the modern day reincarnation, trying to right the wrongs of the iBG Star. Using the headphone jack should prevent any unpleasant surprises in connectivity. It’s priced very aggressively for most iPhone lovers to buy out of pocket, and the test strips are reasonably priced as well. ($12.50 for 50 test strips). And it’s beautifully small. The Align is approximately the size of a 4 quarters stacked together. When plugged into the iPhone, it blends in fairly well with the overall Apple aesthetic. Keep in mind, though, that despite its small size, it must be plugged into the iPhone to work (unlike the iBG Star). As such, it becomes a bit unwieldy to use when paired with the larger iPhone 6 Plus. Initial setup was a breeze. First, I downloaded the free companion app Gluco-Smart in the iTunes store and created an iHealth account. Second, I plugged in the Align to my iPhone, and the app instantly recognized the Align. 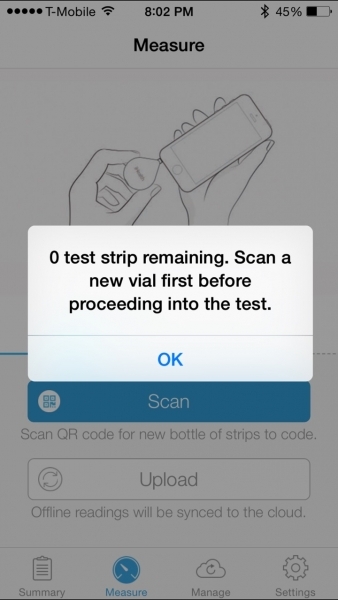 Third, after scanning the QR code on the test strip bottle, the app prompted me to then place a drop of blood on the test strip. Voila! My glucose reading soon after displayed and was stored in the iPhone app’s memory. The app also supports Healthkit, importing and exporting my blood sugar data into Apple’s Health app. The companion app is beautifully designed, as far as iPhone glucose logbook apps go. In fact, as a standalone glucose logbook app, it’s one of my favorites. You can record glucose readings manually (if necessary), time/date, timing label (eg. Before Breakfast, Bedtime, etc), number of carbs consumed, text/voice notes, etc. As you begin to record more entries of glucose measurements, you can conveniently review your glucose logbook in table or historical form. The app also slickly allows you to share reports in PDF, CSV, or Microsoft Excel files. When it works, it’s one of the best overall experiences from hardware to software. Unfortunately, I soon found that it doesn’t always go so smoothly. About 20% of the time, I would plug in the Align into my iPhone and nothing happened. The app thinks for a second, and then continues to act as if the Align is not plugged in (even though it is). About 3 days later, I started to get low battery warnings about 50% of the time it worked, and it completely died about 7 days after that. Keep in mind, since the Align lacks a screen, there is no way to tell if it actually has run out of batteries or if it’s just not working properly. I was willing to give the Align a pass under the assumption that it came with a bad battery. Unfortunately, replacing the battery did not completely fix the problem. It worked again for another week or so, with the same inconsistency, and soon after became completely unresponsive. To make matters worse, during one stretch, the usually excellent companion app gave me an error message every time I opened the app, requiring me to log back in with my credentials. 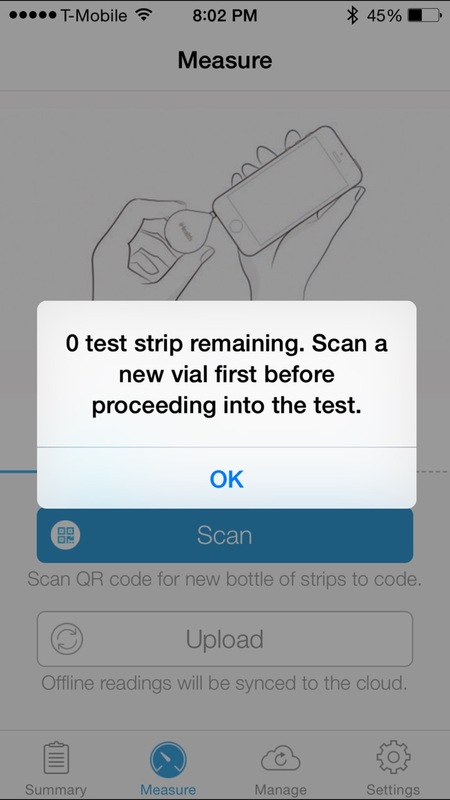 Another particularly frustrating message came about when it rejected my test strips because there were “0 test strip(sp) remaining,” which was clearly not the case. Thankfully, some of those issues were fixed with software updates, but the battery life issues and overall hardware bugs don’t seem to happen to just me. About half of the Amazon product reviews were negative, reporting similar issues with reliability. Despite its appealing price, design, and high-quality iPhone app, I simply can’t recommend the iHealth Align to my patients with diabetes. Checking sugars multiple times each day is tedious enough. Having to compensate for a buggy glucose meter is an absolute dealbreaker. Surprisingly, I would recommend the companion app, named Gluco-Smart, to people with diabetes as a standalone glucose logbook app. It’s free, and you don’t need an iHealth device to use it (an advantage over the also excellent Glooko iPhone app). 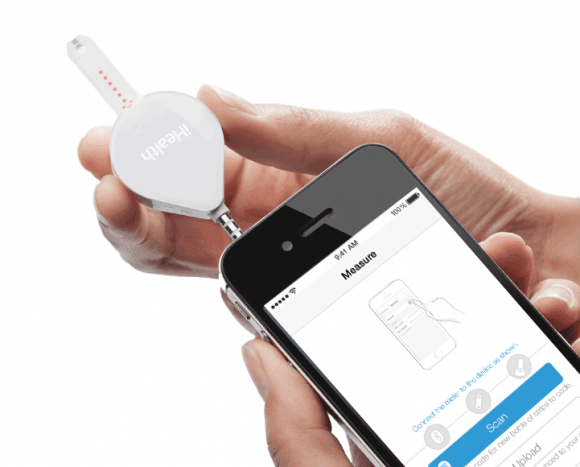 You can manually track your sugars, activity, and carbs. 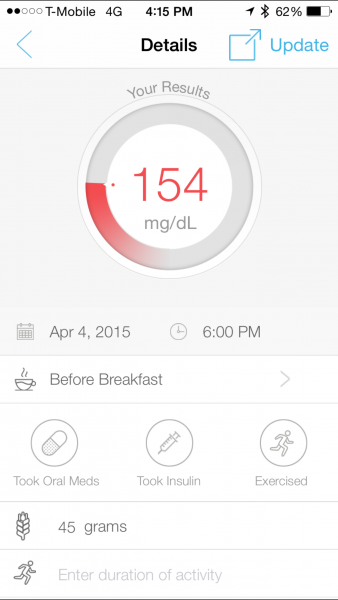 In addition, the app also easily shares reports of your sugars in multiple formats. 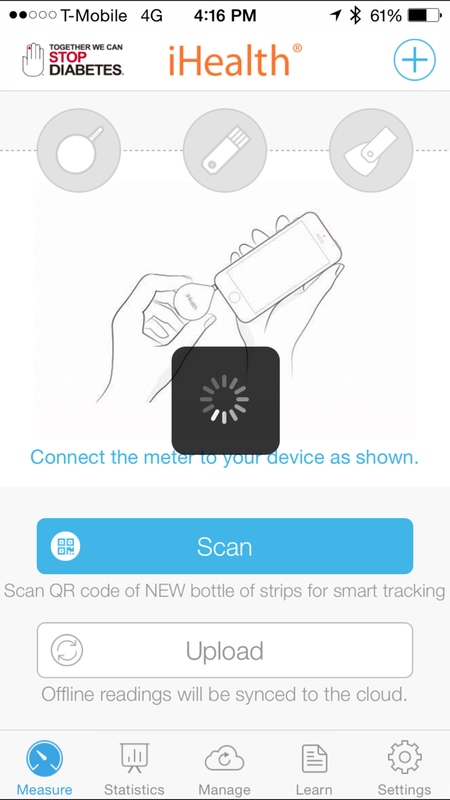 As a digital health enthusiast, the frustration for me is that no advanced glucose meter seems to have it all. With current options like the OneTouch Verio Sync, Telcare, and now the iHealth Align, you can apparently only have two out of the following three features: low price, excellent app, and reliable hardware. The iHealth Align only has the first two. 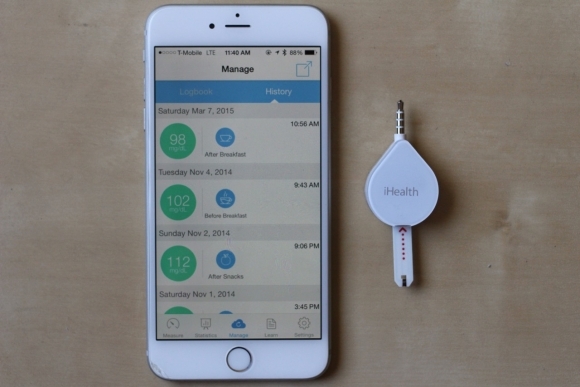 While patients might be able to afford the iHealth Align’s reasonable price, they can’t afford its buggy unreliability.